Drip irrigation is placed at the very top of the system. Use 5/8″ Irrigation tubing with 1/2 gal/hr button emitters. The drip system goes in last on top of the felt so it is easily accessible to observe and verify water flow and change emitter if required. Recommend to use 2 emitters per grid. This helps distribute water more evenly and provides a backup emitter if one becomes clogged. 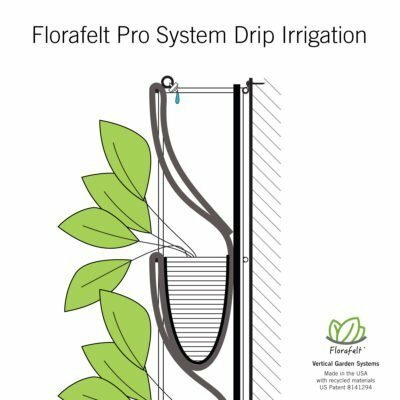 To learn more about drip irrigation systems see our Florafelt Drip Irrigation Page.